Adi Gilbert has been hard at work in his underground lair in Victoria, Australia. He’s the man of the moment in the friendly Textpattern community: as well as being interviewed on TxpQ and offering web design, editorial, and PR services to clients at Great Ocean Media, he’s found time to craft plugins that improve and enhance interaction with Textpattern’s administration interface. adi_recent_tab in action showing much recentness at the end of your mouse pointer. 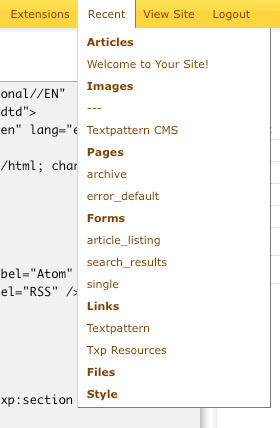 It’s a recent items list for Textpattern admin designed to speed up workflow. It gives you quick access to recently viewed pages, forms, articles, images, etc. 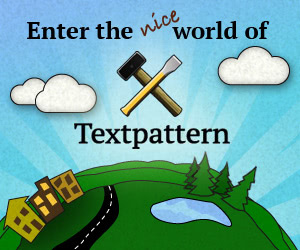 So how can it help us streamline our Textpattern usage? During website development there’s a lot of jumping between pages, forms, articles and images. To find a form takes at least two clicks, the same for a page. To find an article or image, it can sometimes take several clicks and possibly a search. Having recently viewed items available in a list makes it a simple and quick job to get back to them. It also acts as a handy subset of all the elements you’re currently working on — a great memory jogger after a coffee break! Imagine the scenario where you’re creating an article using three associated images and where custom fields contain a link and a file ID. There are too many numbers to remember; and even if you can, a phone interruption will put [an end to it]. With adi_recent_tab you can add the images, the link, the file all in one go. Then when creating the article you’ve got their IDs to hand. No scrappy bits of paper required. Another common situation is where you’re working on a page which contains a number of forms. Normally every time you jump back to the form or page tab, it’s an effort (and an additional click) to eyeball what you’re looking for. Let adi_recent_tab smooth your path through life—just pick what you want off the list. Very handy. So it saves both brain strain and the unnecessary culling of trees to manufacture Post-its to stick around the edges of your screen. A winner for sure. 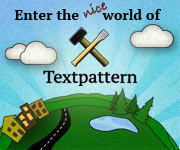 If we convinced you this plugin will save you time, you can download it from the Textpattern Plugins directory right now.